BlogPaws Day 1: Success? Not so much. But it was worth a try. We called it quits about halfway through the day. Heather, Mr. K and I attended two classes together and, for the most part, made it through without any major damage done. I should've known it was all downhill when Mr. K's arch nemesis decided to take a seat - you guessed it! - right in front of him in the very first class. At first, it was as if Mr. K himself didn't believe what was going on and struggled to believe it was real. But as the class went on and that M-E-O-W got more defined, Mr. K could not contain himself. He squirmed, whined and even worked himself up to a heavy pant. 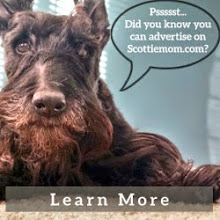 And for those who know what a Scottie can get like when there is an evil C-A-T around, you know just how embarrassed this Scottie Mom was. Fast forward through the second class (which Heather and Mr. K acted beautifully for and even scored a few treats) and Mr. K decided to rumble with a fellow pup for about 0.25 seconds before Scottie Mom snatched him up and took him outside to cool off. We walked around the hotel so Mr. K could mark some territory and came back to go through the exhibits - hands down, Heather and Mr. K's favorite part of the day. 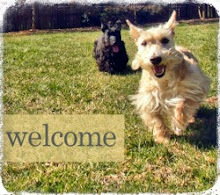 Everywhere they turned, they were handed treats and asked to pose for pictures (which, as loyal Scottie Mom followers know, Heather and Mr. K are always happy to do). Then, Mr. K decided to start his shenanigans again and lifted his leg on one of the vendor's boxes. As any horrified Scottie Mom would do, I apologized profusely. Just a few minutes later, we settled in to relax in the lobby waiting for our next class to start. That's when Mr. K decided to squat. You can only guess just how humiliated I was. And that was just minutes before I marched the doo-doo bag outside, took the pups out for their second walk within mere minutes and came back in the lobby to flip - yes, FLIP - over a bench I neglected to see. (Wearing a dress, I might add...) So, here I was, two Scottie dogs and two bags in hand, landing face first on the floor. Luckily for me, my extended humiliation didn't appear to have been witnessed by others and I hoped it would end there. I picked myself up, sat down with the pups to take some pictures documenting the memorable morning and called Scottie Dad to come pick me up. I had enough adventure for one day and was ready to retire. Tomorrow, I'll likely give another go at the BlogPaws conference but I can't decide: go solo or just with Miss Heather Beather? It was a bit much carrying the two around from class to class and Heather sure does know how to network the best out of the three of us! In the meantime, we're set out to find some new adventures of a more touristic nature! Taking Heather sounds like a plan. Mr. K can have some man time with Scottie Dad. Just make sure to bring back treats for him! :) I hope you visited Fala on your touristic adventures. BOL. Does everyone bring their pets to the conference session. That must be quite a sight. What an experience!!! It is always nice to share time with your pups, and I imagine it is funnier to share time with them attending a conference!! WOW! I would love to have such a time with my Plutonio as well...!!! Thank you for sharing this with us! And good luck tomorrow, with your lovely Heather Beather!!!! PS> As Shanno remarks, I also hope you can visit Fala on your touristic adventures!!! Shame on you if you lost any part of the treasure in the poo-bags. A whole bunch of effort went into making that poo. Bring them where ever you want just bring bags & paper towels! Scottitude? Yes, Mam, he's got it! And this is exactly what endears us to the Scottie breed: not the messes on the floor but the way they get their point across :-).